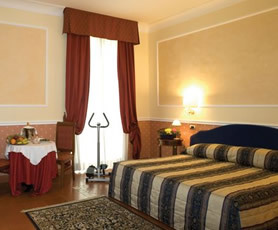 The 39 bedrooms at the Antico Palazzo Rospigliosi are spacious, comfortable and well decorated, as well as very bright and entirely soundproofed. From most rooms guests may enjoy a suggestive view over the internal courtyard and from the other rooms over the peaceful garden. 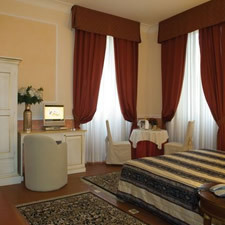 All our rooms and bathrooms have been refurbished respecting the style and period of our hotel. Restaurant: the hotel offers a restaurant which, beside to the breakfast service, gives prominence to the Italian cooking tradition through traditional dishes made with Mediterranean products. Breakfast: a rich buffet breakfast is served in the cosy and quiet breakfast room. Bread, pastries, ham, cheese, fresh fruits, yoghurts and juices will be at your disposal. A kind breakfast personnel will provide you with hot drinks as tea, coffee, milk and cappuccino. Cocktail Bar: inside the hotel guests will find a fantastic cocktail bar where to relax sipping a drink after a hard day of sightseeing in Rome. Conferences and Meetings: Antico Palazzo Rospigliosi offers 2 halls well-equipped for your meetings, conferences and expositions. These two rooms may be also used as reading rooms 24 hours a day. Church: from the Hotel you have access to two little churches, one of them may be used on request to celebrate your private religious ceremonies. Concierge: Our friendly staff will be glad to help you during your stay in Rome suggesting you places of interest, typical restaurants and what to do. The lobby is one flight up from the street level and there is no lift. Parking: we offer our guest the possibility to park their car for free in our car park.